Therefore we see that the datacenter world is making a transition from an artisanal mode of operation to an industrialized mode of operations. To make the industrialization of datacenters possible there is a need for uniformization, standardization, and automation to get the benefits of economy of scale. One of the current big things in this datacenter transformation is DCIM. Until recently there was a disconnect between the facility and IT infrastructure in the datacenter. To get rid of the limited visibility and control of the physical layer of the data center we see the rise of a new kind of system: the Data Center Infrastructure Management System (DCIM). You could say that a DCIM system is the man in middle, a broker between the demands of the IT world and the supply of power, cooling, etc. from the Facility world. The DCIM is layered on top of the so called SCADA system. 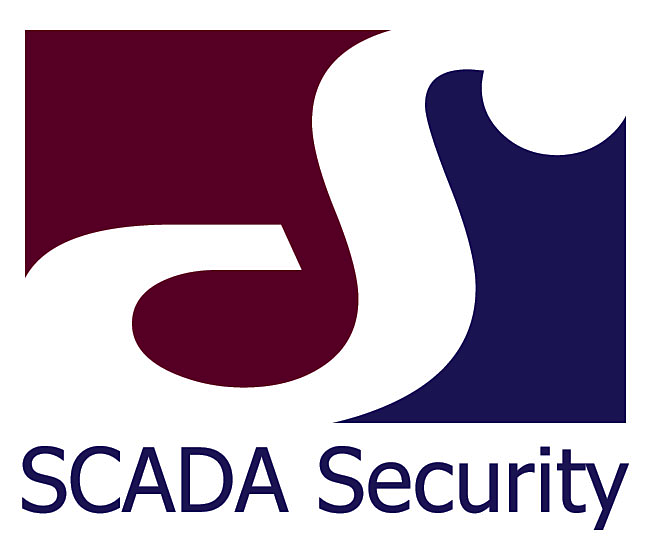 Where SCADA stands for Supervisory Control And Data Acquisition, the computerized control systems that are the heart of modern industrial automation and control systems. So currently DCIM is a hot topic, and the added value of the different kind of flavors and implementations of DCIM systems are heavily discussed. But something is missing. The world, moves rapidly towards the digital age, where information technology forms a crucial aspect of most organizational operations around the world. Where datacenters provide the very foundation of the IT services that are provided. Therefore datacenters can be considered as a critical infrastructure, assets that are essential for the functioning of a society and economy. But how are these assets protected? And here we are not talking about the physical security of a datacenter or how save is your business data stored and processed in a datacenter. Here we are talking about the security of the facility control systems, the cooling, the power, etc. Beware that DCIM functionality is not only about passive monitoring and dashboards but also about active controlling and automation. The information obtained with SCADA systems will become crucial to control the infrastructure sides of facilities and even IT equipment. With DCIM the traditional standalone SCADA and Building Management Systems (BMS) get connected and integrated with the IP networks and IT systems. But also the other way around, SCADA and BMS get accessible by means of these IP networks and IT systems. This, by misusing these IP networks and IT systems, creates the risk of a (partial) denial of service or damaged data integrity of your DCIM and SCADA/BMS systems and thus the disabling of a Critical Infrastructure: The Datacenter. In most organizations SCADA and BMS security are not yet in scope of the activities of the Corporate Information Security Officer (CISO). But awareness is growing. Although not specifically focused on datacenters the following papers are very interesting. 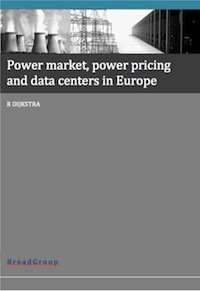 So read it, make your own checklist and get this topic on the datacenter agenda! 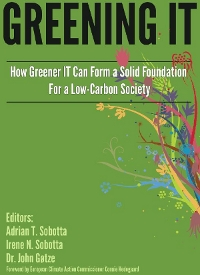 For energy-efficiency , PUE and DCiE are one of the most commonly metrics and formulae (http://thegreengrid.org/). But how to get these kind of figures for your company? 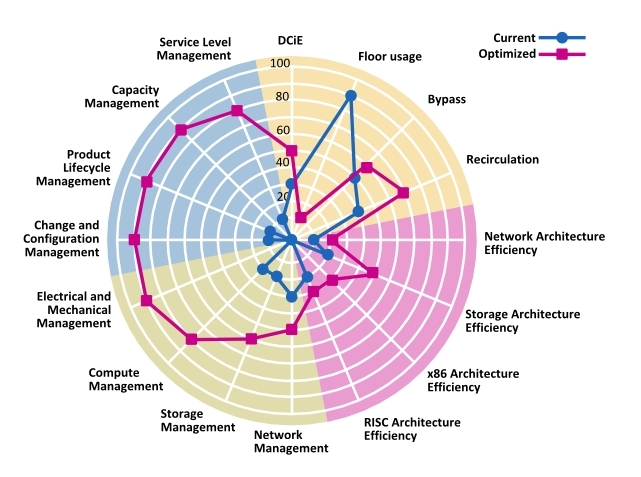 A data center is a complex system so energy metering isn’t easy. Once electricity is supplied to a data center, several and various devices consume the electrical power. A data center has from a power perspective a supply chain that consist of four large building blocks: the IT infrastructure (servers, storage and network), the primary power supply (UPS, PDU, etc. ), the secondary support supply (cooling, generator, air handling) and the tertiary support supply (lighting, and everything else). Virtually all power consumed by the IT infrastructure is converted to heat. Typically about thirty to fifty percent of total power usage in a data center represents the load placed by IT infrastructure while the other percentage is for cooling, power distribution, lighting, etc. A practical example of using this kind of metrics is given by Google who made their energy usage public (http://www.google.com/corporate/green/datacenters/measuring.html). IT infrastructure is basically a value stack. A supply chain of stack elements who act as a service component ( (People, Process and IT that adds up to an IT service). For each element in the stack the IT organization has to assure quality as agreed on. In essence these quality attributes were performance, availability, confidentiality and integrity. One of the most big challenges for the IT organization was and is to coherently manage these quality attributes for the complete service stack or supply chain. Energy as quality attribute is a new kid on the block. This attribute is composed of the Power, Cooling, and Floor Space sub attributes. These attributes are not independent from each other. For a given data center these resources are constrained therefore, together, these attributes form a certain threshold. If the demand for IT capacity reach this threshold further growth of the IT load is inhibit because of technical (over heating, not enough power) and or financial (excessive capital investment) reasons. 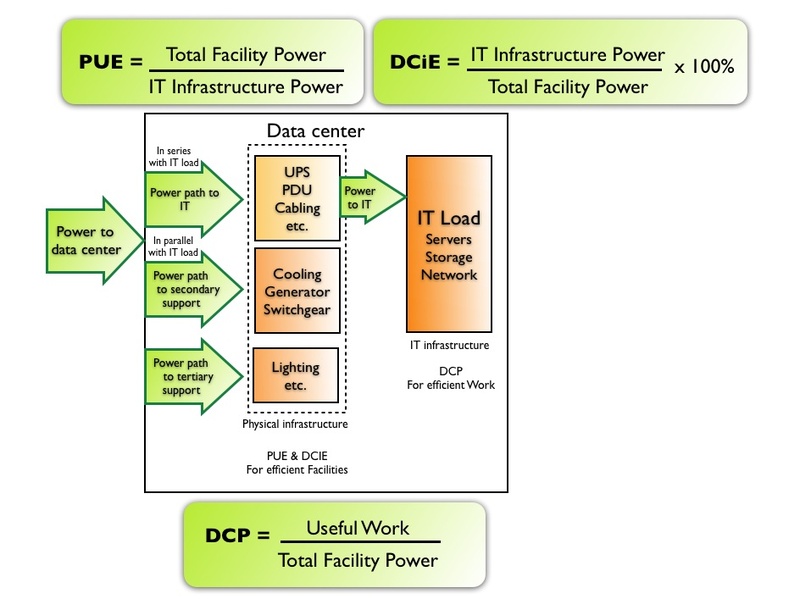 To improve the energy efficiency of existing data centers, as well as making decisions on new data center there are some metrics being used: Power Usage Effectiveness (PUE), Data Center Infrastructure Efficiency (DCIE) and Data Center Productivity (DCP). 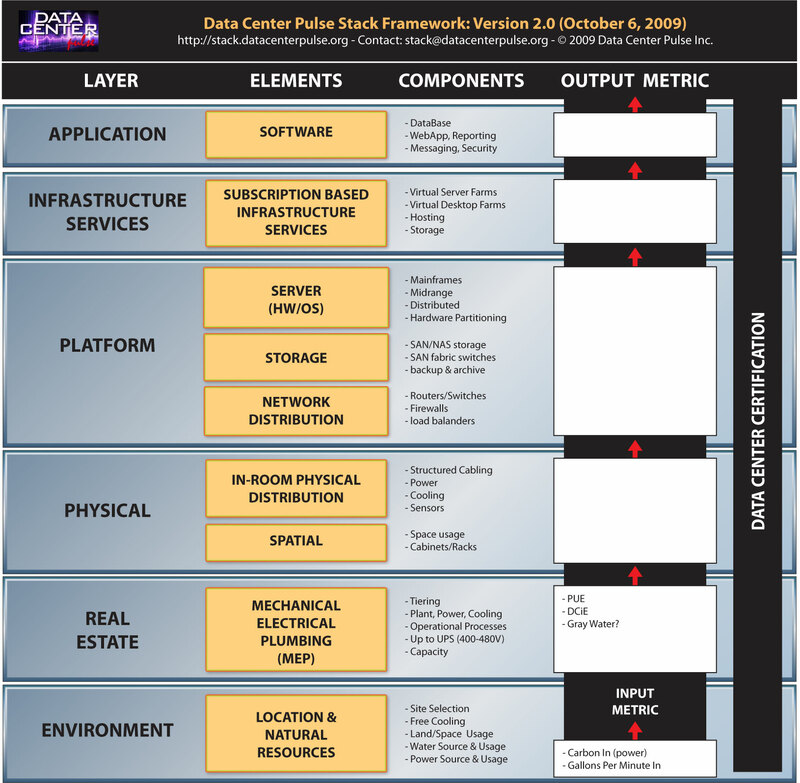 Ideally, these metrics and processes will help determine if the existing data center can be optimized before a new data center is needed. To steer and control power usage successfully a power usage monitoring system should be in place to get this done. For designing an efficient power usage monitoring framework, it is important to assemble a coherent system of functional building blocks or service components. Loose coupling and strong cohesion, encapsulation and the use of Facade and Model–View–Controller (MVC) patterns is strongly wanted because of the many proprietary energy metering solutions. Most vendors have their own proprietary API’s to interface with the metering devices. Because energy metering differ within and between data centers these differences should be encapsulated in standard ‘Power services‘. Services for the primary,secondary and tertiary power supply and usage. For the IT infrastructure (servers, storage and network components) power usage we got the same kind of issues. So the same receipt, encapsulation of proprietary API’s in standard ‘IT Power services‘, must be used. Environmental conditions outside the data center, the weather, has its influences on the power consumption of the data center so proper information about this must be available by a dedicated Outdoor service component. 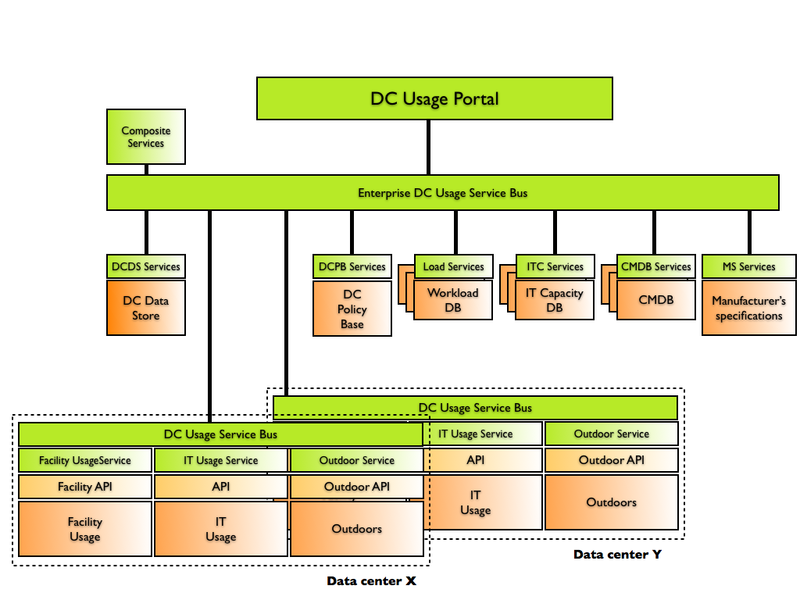 For a specific data center an DC Energy Usage Service Bus must be available to have a common interface for exchanging energy usage information with reporting systems. 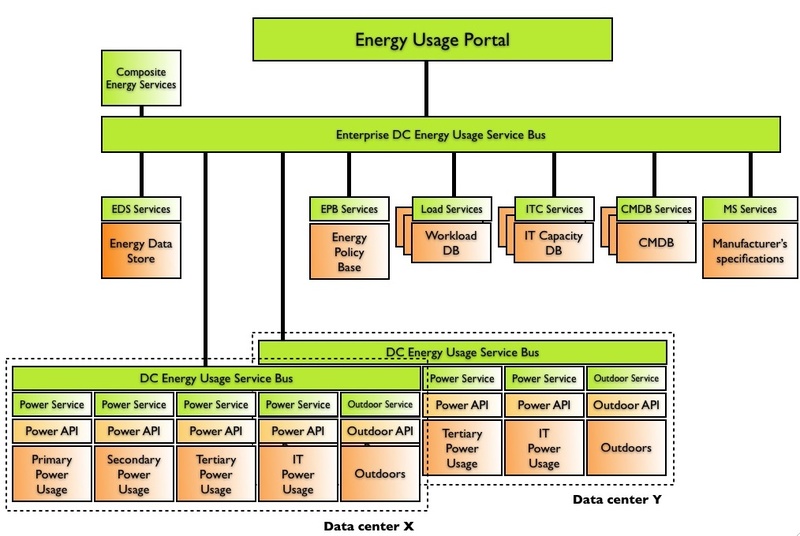 The Energy Data Store is a repository (Operational Data Store or Dataware House) for energy usage data across data centers. The Configuration management database(s) (CMDB) is a repository with the system configuration information of the primary, secondary and tertiary power supply and the IT infrastructure of the data centers. The Manufactures specification databases stores specifications/claims of energy usage of components as provided by the manufactures. The Energy Policy Base is a repository with all the policies, rules, targets and thresholds about energy usage. 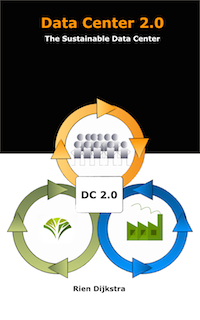 The Enterprise DC Energy Usage Service Bus must be available to have a common interface for exchanging policies, workload capacity, CMDB, manufacturer’s and energy usage information of the involved data centers, with reporting systems. The Energy Usage Portal is the presentation layer to the different stakeholders that want to know something about the IT energy usage. 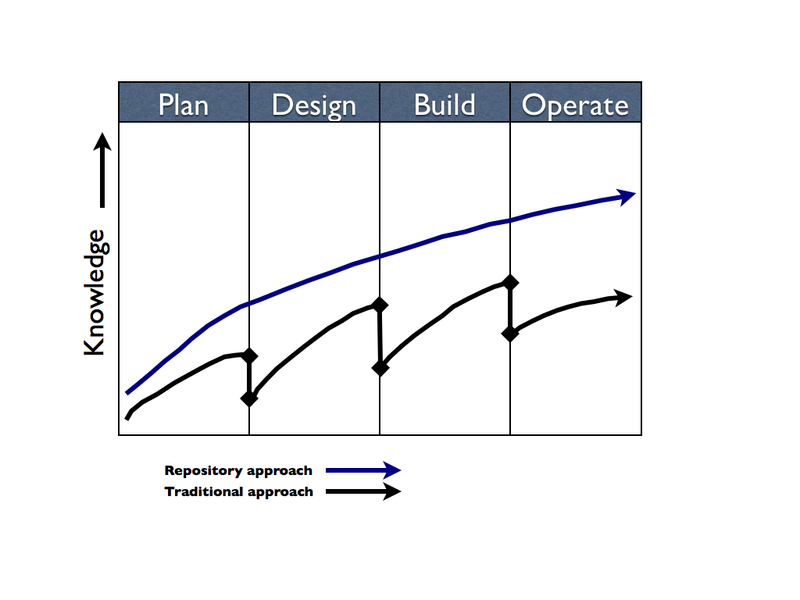 Usage of an architectural framework is a must to get an energy monitoring environment working. This assembly of service components gives you the opportunity to see the average or instantaneous energy usage and compare this with the average or instantaneous IT workload and available IT capacity. Comparisons with the Energy Policies and the manufacturer specifications/claims of energy usage are also possible. The separation of powers, also known as Trias Politica, is a governance model for democratic states. Under this model, the state is divided into branches, each with separate and independent powers and areas of responsibility. The normal division of these states is into an executive, a legislature and a judiciary branch. Montesquieu [1689-1755] did specify that “the independence of the judiciary has to be real, and not apparent merely”. The judiciary is generally seen as the most important of powers, independent and unchecked. To prevent one branch from becoming supreme, and to induce the branches to cooperate, governance systems that employ a separation of powers need a way to balance each of the branches. Typically this is accomplished through a system of “checks and balances”, the origin of which, like separation of powers itself, is specifically credited to Montesquieu. Checks and balances allows for a system based regulation that allows one branch to limit another. If we look how IT is currently organized, where is the separation of powers? In a lot of cases executive and judiciary branches are mingled. There is mostly not a real clear stated legislation that gives direction to the executive branch and gives the judiciary branch the means to evaluate and to give a verdict. In certain sourcing models the separation of power get even worse. Executive, legislature and judiciary branches are intermingled and partly placed by other external organizations (outsourcing). For the judiciary branch there is some times, ad hoc, the use of auditing. With auditing a starting discussion about what is the legislation that should be referred to is not uncommon. So why do we treat IT differently? Shouldn’t we separate the vision and strategy from the operation/execution, shouldn’t we separate the operation/execution from the monitoring and evaluation? Lets make IT more transparent with a governance model that separates powers and states checks and balances.